Before the day gets too hot and just after the dew has dried, I harvest the calendula blossoms (Calendula officinalis) from the gardens. 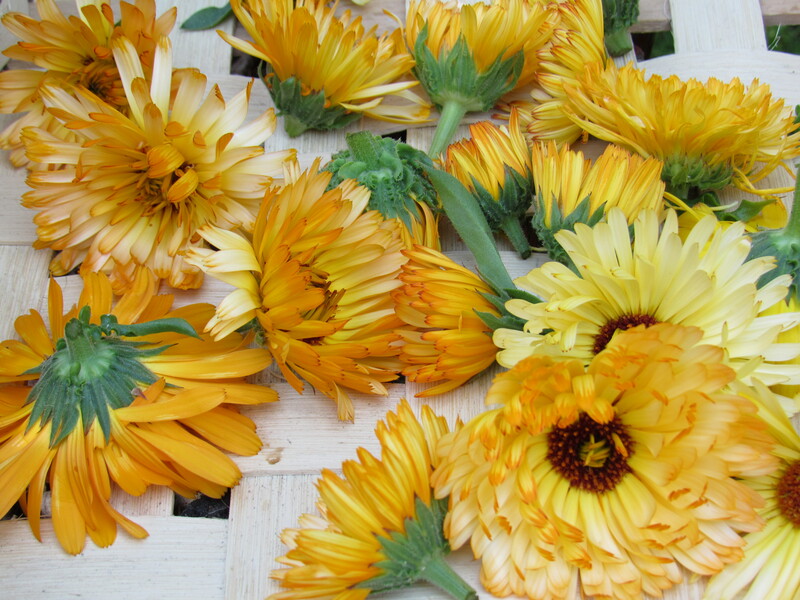 I’ll dry the flowers for making calendula oil and then add the oil to some of the salves and creams we make. Calendula is one of my favorite ingredients to use in ointments. 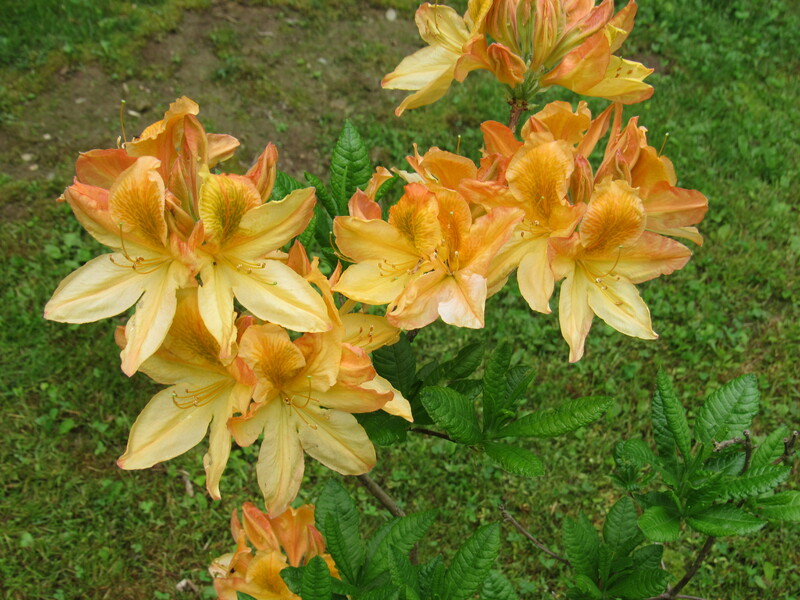 It is antiseptic, has antimicrobial properties, and is an anti-inflammatory. As a topical ointment, it helps to heal wounds, soothes burns, rashes, and bug bites, and aids in collagen regeneration. It is also an antifungal. Some of the dried flowers will be stored in clean glass jars for making tea. We use the tea to promote digestions, as an immune booster, and in soothing abdominal cramps. The very last picking will be kept fresh and put into a pot of hot water, left overnight, strained, and then used for a dye bath. Along with a mordant of alum ( A mordant is a chemical binding agent that adheres well to both the fibres and to the dye. The word comes from the Latin mordere, which means to bite), it will produce a beautiful golden yellow dye to sink my wool into. Very nice indeed. I love having these bright blooms among the veggies in the garden (that is where we grow them) and though we harvest most of their cheery orange and yellow blossoms, we do leave a portion of the flowers for reseeding. The gardens here are glorious at the moment, despite the lack of rain. We spend much of our time watering, watering, and watering. 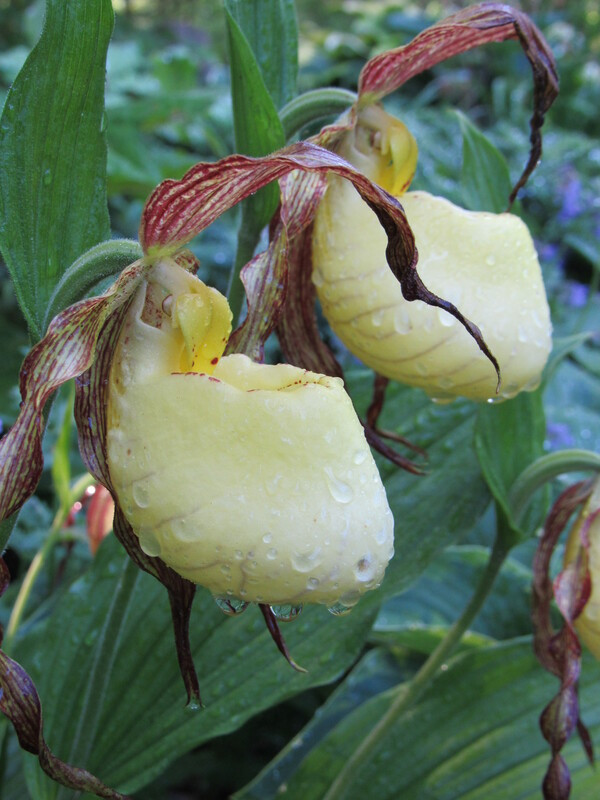 The showy lady slippers, the corydalis, and bowman’s root are all in bloom…to name a few. Beautiful. We recently had a guest from South West Harbor visiting the nursery, a lovely lady who declared that pulling up a seat to enjoy Cypripedium kentuckiensis for an entire afternoon would suit her just fine. Can’t blame her…they are quite stunning. Happy gardening to all, and let’s hope we get some rain soon! Still spots open for the tea making class at Fernwood! Hot or cold, tea always hits the spot! 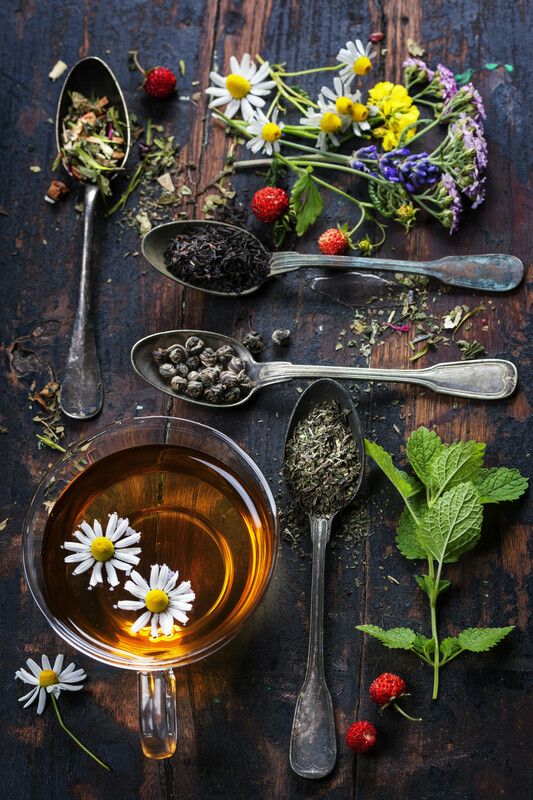 Join us on Saturday, July 16th, from 1:00 to 3:00 p.m. for an afternoon of herbal tea making. Learn to craft your own tea blends using garden-grown herbs. We’ll also be including some local wild harvested plants that are easy to identify and well-known for their health benefits. Herbs are plants that are valued for their medicinal, aromatic, or savory qualities. From chamomile to mint to lemon balm, drying fresh herbs for aromatic teas is simple and gives you yet another reason to put your summer herb garden to use. The class will begin with an informative talk on selecting, growing, harvesting, and drying herbs ….we’ll be taking into consideration both taste and the specific health benefits of these plants while blending our tea. Next, It’s time to get creative and start making tea ! Each participant will make their very own tea blend to take home, using an array of dried herbs from our gardens. At the end of the class, you will also get a selection of 3 herbs, potted, and ready to take along with you and plant in your own herb garden. Of course, if there’s going to be tea, there will most certainly be scones! For more information check out our ‘classes and more’ page. If you’d like to sign up for this class, you can email us at fernwoodnursery@fairpoint.net or call us at 207-589-4726. My grandmother was a great pie maker. A wonderful pie maker. 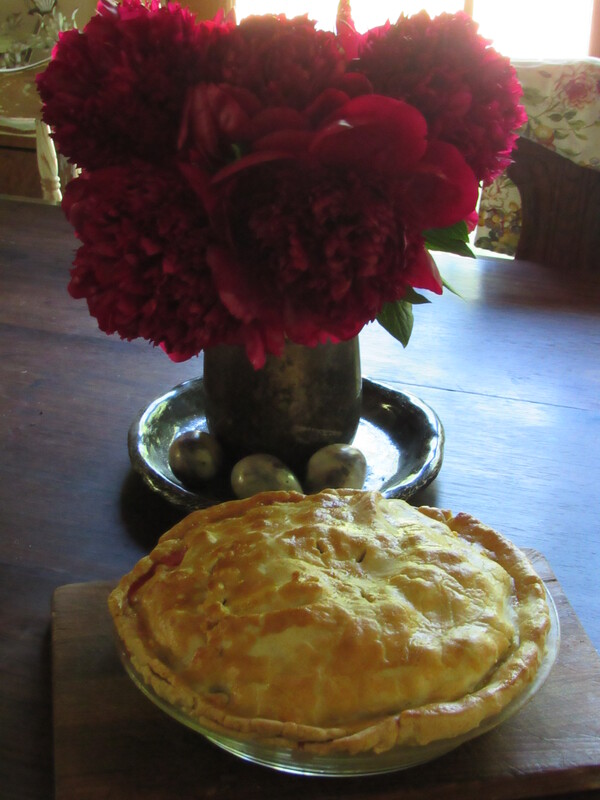 She had a way with crust….flakey and tender. Always. I think it was her innate patience. This she applied to almost everything she did. She was a keen and patient observer, a contemplated thinker on almost all issues, and seemed to take delight in the ability to pause…..to take notice, to savor, to consider. Me, being a bit more rambunctious in nature, took years ( too many!) to master even a bit of this approach to life. I’m still working on it. 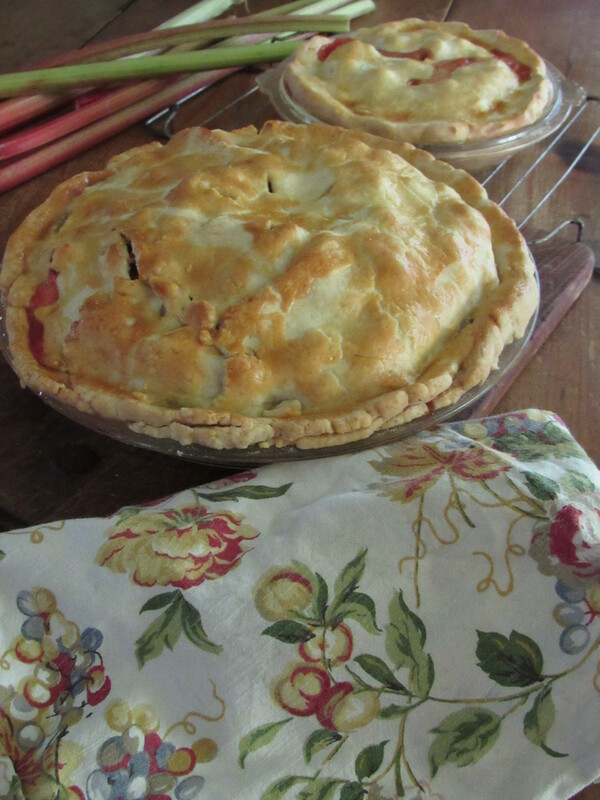 This morning I baked a rhubarb pie. My grandmother’s recipe, along with her crust instructions. I did this in the wee hours, quietly, and with as much patience as I could muster…..thinking of her. Have a lovely, slow, and blissful day all! We are early risers in this household. By 4:30-5:00 a.m. we are up and ready to start the day. Even as a young person I wasn’t much of the ‘sleep in’ type, nor was Rick. It’s the other end of the day and trying to stay up beyond 8:00 p.m. when we begin to fade. I still like to read a bit before falling asleep. This often results in a page or two before I nod off with the book still open and my eyeglasses laying crooked across my face. I can’t blame this on the book I’m reading, it’s not boring me to sleep. I’m just plain tuckered out! I like this book, Robin talks as much about her personal life as a mother, teacher, and her own experiences, as she does about some of the plants and animals that share our natural world. I do think it is important that within our ability to understand the world from a scientific approach, we don’t lose our wonder and appreciation for the spiritual gift that nature provides. As I have said before, I understand the mechanics of how a seed germinates and grows into a blooming plant….but I mostly love being forever stunned, surprised, and delighted by this process. 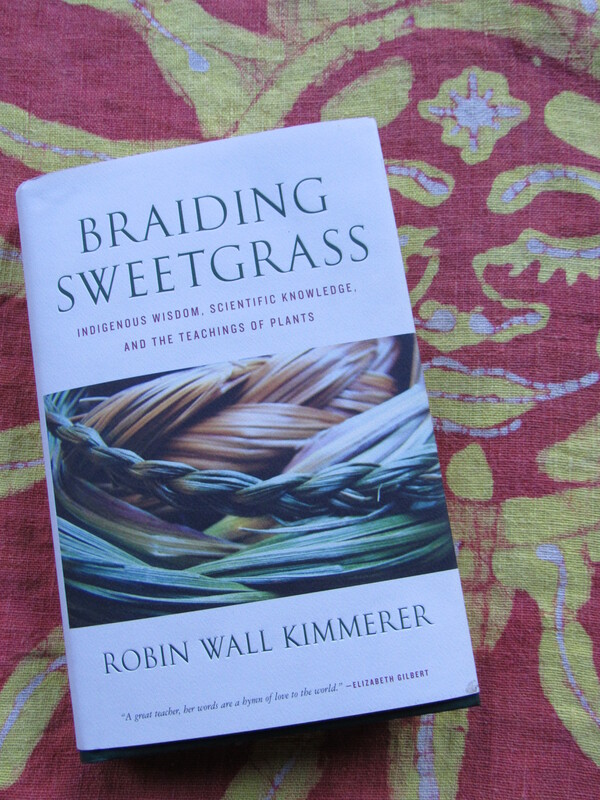 In Braiding Sweetgrass, Kimmerer brings these frameworks of understanding together in original ways, taking “us on a journey that is every bit as mythic as it is scientific, as sacred as it is historical, as clever as it is wise” ( Elizabeth Gilbert). Now, if I can just keep my eyelids open a little longer at night, I can finish the last two chapters! What are you reading this summer? I’d love to hear! 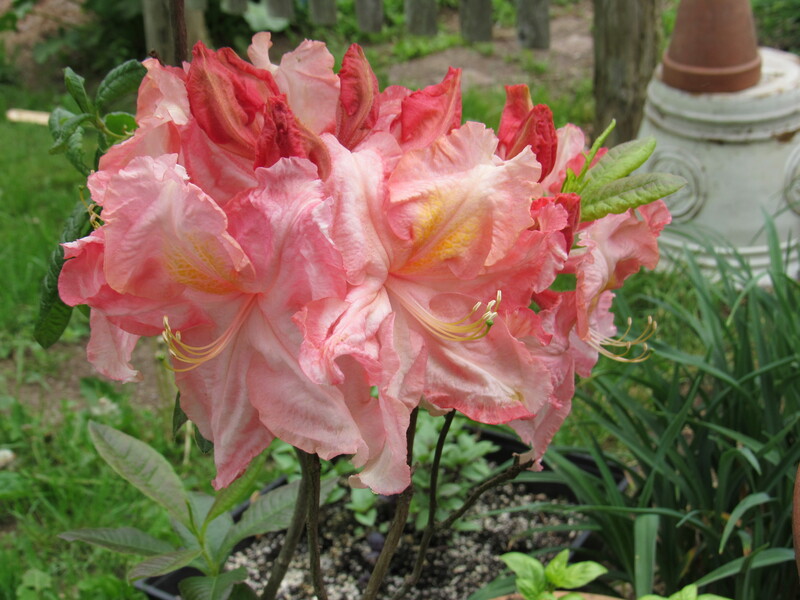 This little gem has been catching the eyes of customers while wandering through the nursery here at Fernwood. 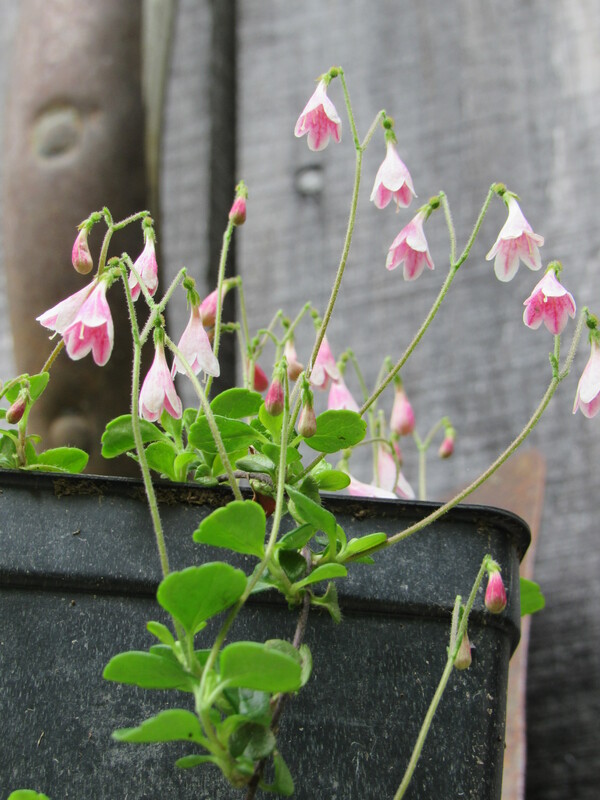 Linnaea borealis (commonly known as Twinflower) is a sweet little Maine native that often goes unnoticed in the woodland, except for when it is in flower. 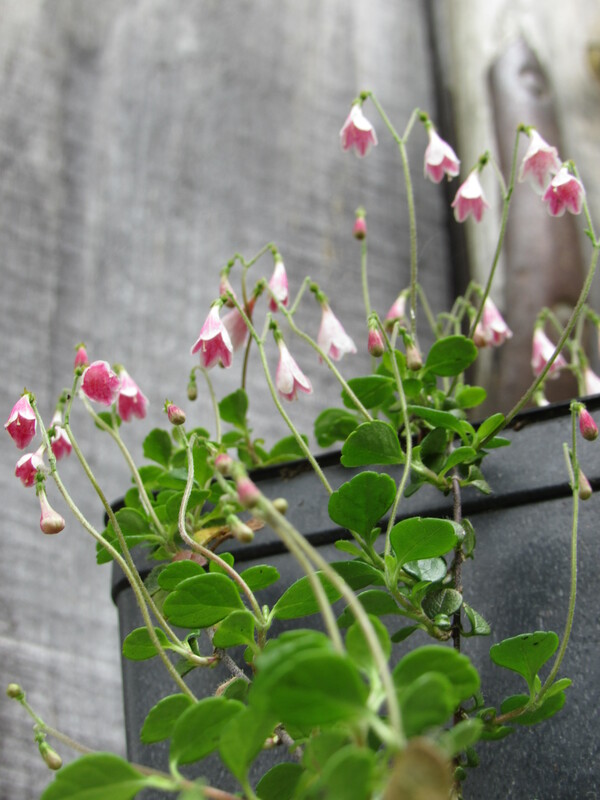 A small trailing ground cover with glossy evergreen leaves and dainty bell-shaped pink and white flowers, it surprises people with its sweet all-spicey fragrance. 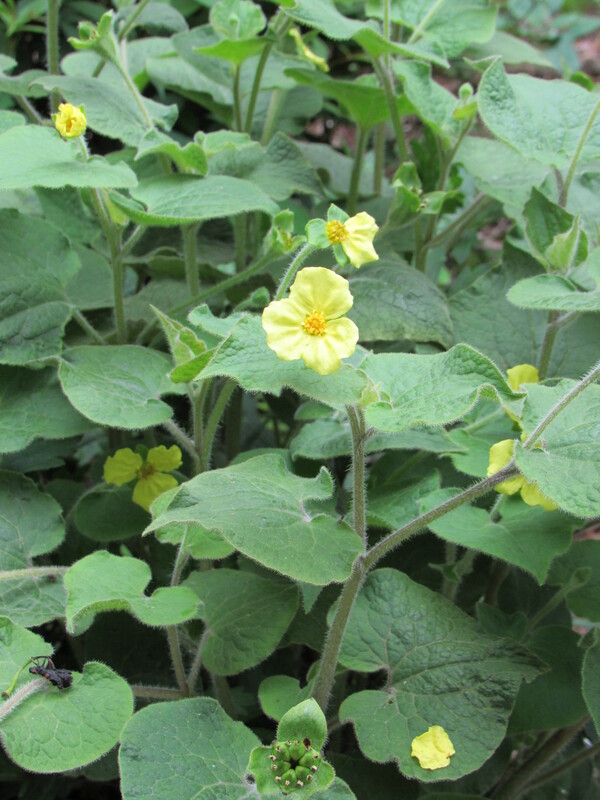 The nodding twin flowers are held on an erect stem about 3-4 inches above their (also twin) leaves. Sometimes the smallest and less obvious plants can be the most delightful ones to happen upon! Our very dear WWOOF volunteer (Zoe) has gone to her next farm assignment over in the Maine western foothills and Dottie, our little bottle lamb, will be leaving this week to graze on grassy pastures over at our friend Sally’s. We’ll miss Zoe’s enthusiasm and positive energy (and her very good sense of humor!). We’ll also miss the pitter patter of our pampered lamb making herself comfortable inside the house. 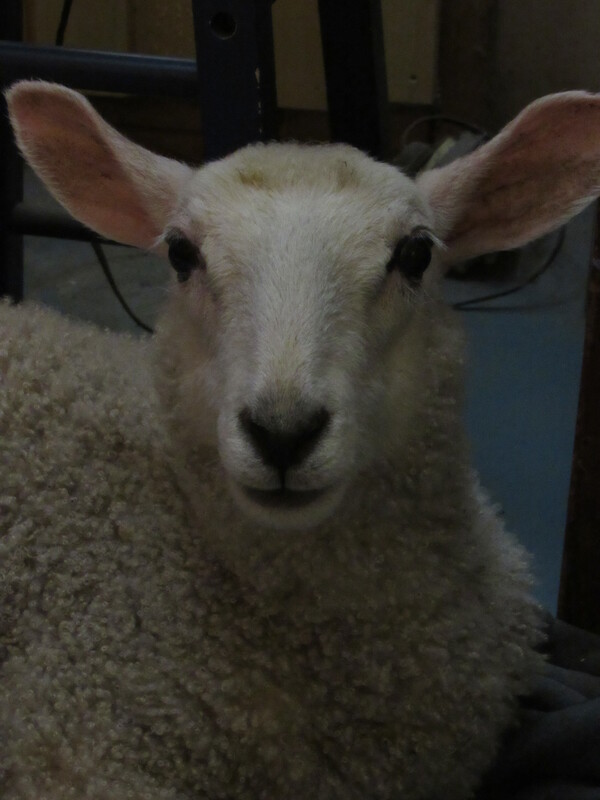 But she’s bigger now and ready to rejoin a flock of fleecy friends. There are also some comings and goings in the gardens. 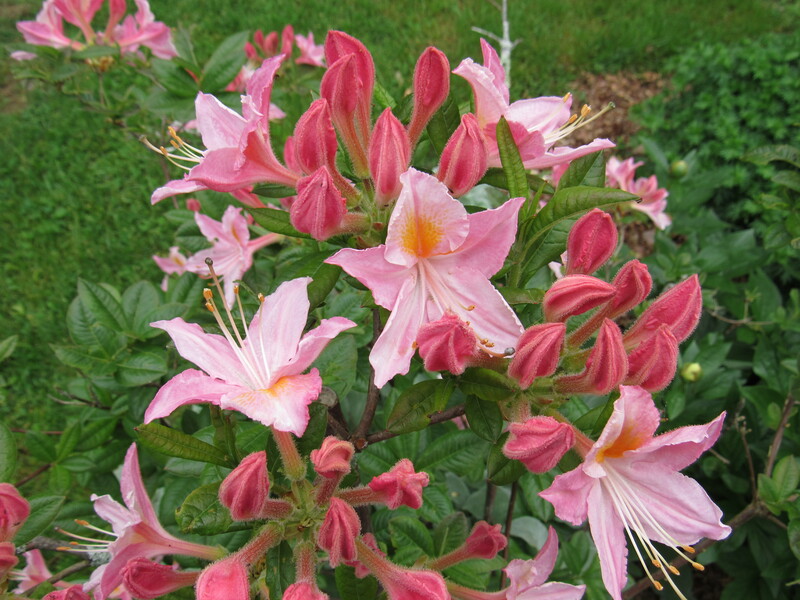 Those wonderful azaleas are coming into bloom. Gorgeous… and some with a light sweet fragrance. One of our favorite plants, Saruma henryi, an upright and shade loving wild ginger, is also in bloom and quite lovely. 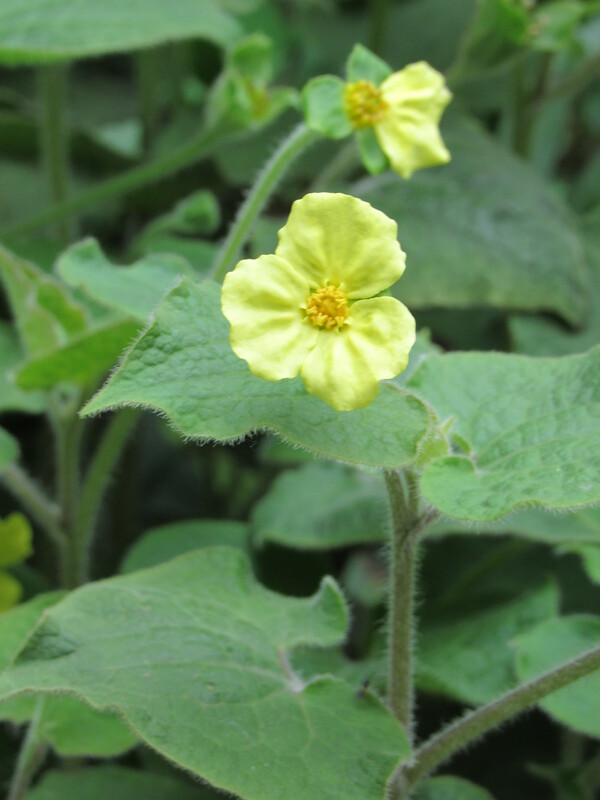 Its soft yellow 3 petaled flowers and slightly fuzzy leaves are a beautiful addition to the woodland garden. The month of June brings a new look to the gardens. Fuller now with the larger plants…hosta, rodgersia, ferns, polygonatums, and woodland peonies (to name a few) making an impressive statement.This being said, gems like Saruma henryi, anemonellas, and dodecatheons ( again, to name a few) are no less striking and appreciated. We, as usual, remain busy in the nursery continuing to pot up new additions and also to replenish the plants that have gone home with our customers. These comings and goings at Fernwood Nursery include people, plants, and….lambs. Helping out in the gardens, our recent lovely WWOOF visitor…Zoe! We have spoken of the WWOOF program many times before. In the organization’s own words; “It is an exchange. In return for volunteer help, WWOOF hosts offer food, accommodation and opportunities to learn about organic lifestyles“. As many may know, we have been a WWOOF host for about 5 years.The visitors who have come to help and be a part of the daily activity here at Fernwood have been a true delight. Of course, the extra set of hands to help with our busy lifestyle….tending gardens and animals, running the nursery, maintaining this choice of sustainability, is a great help to us. Even if a visitor comes to volunteer without any experience in farming or rural living, their enthusiasm and eagerness to help and to gain skills adds to the energy around the farm. Each WWOOFer that comes almost always leaves as a dear friend. We miss them when they leave. For us, the WWOOF exchange is not about ‘free help on the farm’ but becomes a wonderful opportunity to share experiences. We can teach folks about plants and how to raise sheep or about making cheese, and in return we get to learn more about how people choose to live in other parts of the world. Last year we had an incredible WWOOFer from Italy ( Cristina, hi! ), a retired attorney from New York (Hi Kim), the nicest, most enthusiastic guy from Columbia ( would love to hear from you, Jaime! 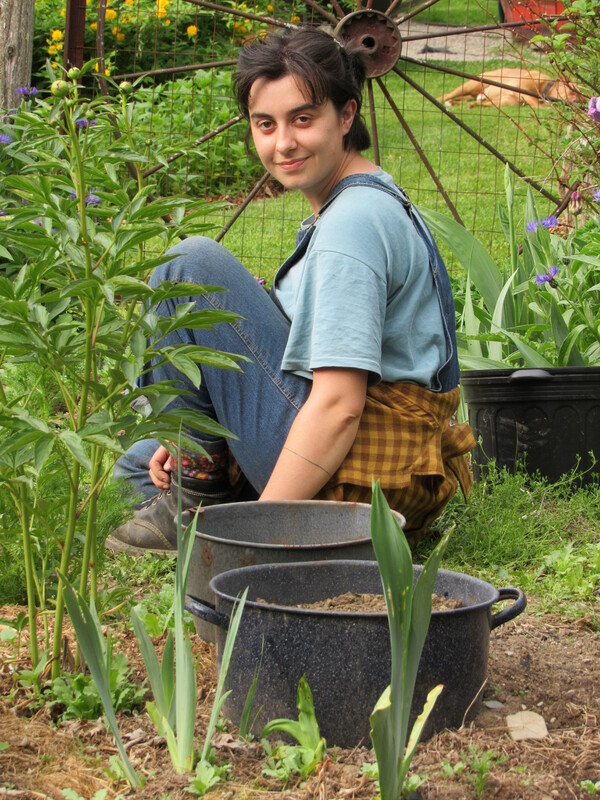 ), a returning WWOOFer and UNH student (Hannah!! See you in July! ), and right now…..Zoe, who we’d like to keep around for the rest of the summer but who will be off to experience another farm and WWOOF opportunity soon. At the end of a long day of weeding or moving sheep fence, there’s nothing better than sitting around the dinner table sharing stories and engaging in lively conversation. We have very much enjoyed being a WWOOf host and look forward to all the new volunteers that find their way to Fernwood! This thing called WWOOF…awesome!